In mid April, the United States Mint announced their intention to offer the 2012 American Eagle San Francisco Two Coin Silver Proof Set. This set would be issued in part to celebrate the 75th anniversary of the San Francisco Mint at its currently location and would include two Silver Eagles with the “S” mint mark. Specifically, the two coins included in the set were a proof and reverse proof 2012-S Silver Eagle. Initially, both coins were believed to be exclusive to the set since the standard proof version offered individually contained the “W” mint mark. Following the conclusion of the offering period for the set, it was later revealed that a proof coin with “S” mint mark would also be included in the Making American History Coin and Currency Set. 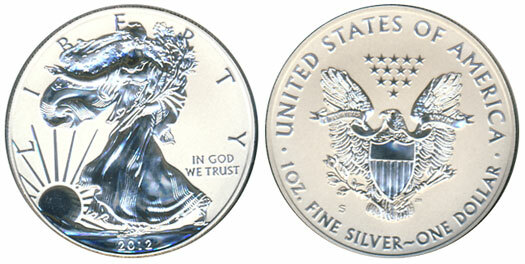 The 2012-S Reverse Proof Silver Eagle has remained exclusive to the San Francisco Set. The Mint took an uncharacteristic approach to offering the set. Other special sets for the series had been offered with a stated maximum mintage and had generally remained available until a sell out was reached. Likely in response to the unexpected early sell out of the previous year’s 25th Anniversary Set, the US Mint decided to offer the sets for only a limited time period and mint to demand based on orders received during the period. Sales officially opened on June 7, 2012 at 12:00 Noon ET at the price of $149.95 per set. Despite the fact that collectors would have a lengthy period of time to place orders, many still rushed to submit their orders early. Within the first day, orders for the set reached 85,341 as indicated on a “sales odometer” that the US Mint placed on the product page. The total quickly surpassed the 100,000 mark, but then the pace of sales began to slow. Near the end of the offering period, the pace of orders rose with the final cumulative total indicated as 251,302 upon the close of sales on July 5, 2012 at 5:00 PM. Several months later, the Mint released an updated final unaudited sales figure of 224,981 sets. The final audited mintage was later indicated at 224,935 sets. The first sets began to ship to collectors on July 29, 2012. Each set came packaged in a custom blue lacquer presentation case with certificate of authenticity. As in the past, third party grading companies offered special designations for coins issued within the set.